Lyophilized Katchatka berry juice 80% ± 5%, micronized apple fiber 20% ± 5%, cellulose coating. Should be stored out of the reach of young children. Store in a dry place, avoid excessive heat. Do not use if the seal under the lid is damaged or missing. Use two (2) capsules a day, preferably before a meal. Helps in the treatment of eye diseases. A natural source of valuable antioxidants - flavonoids, plant polyphenols anthocyanins. Has a beneficial effect on the proper functioning of the nervous system. 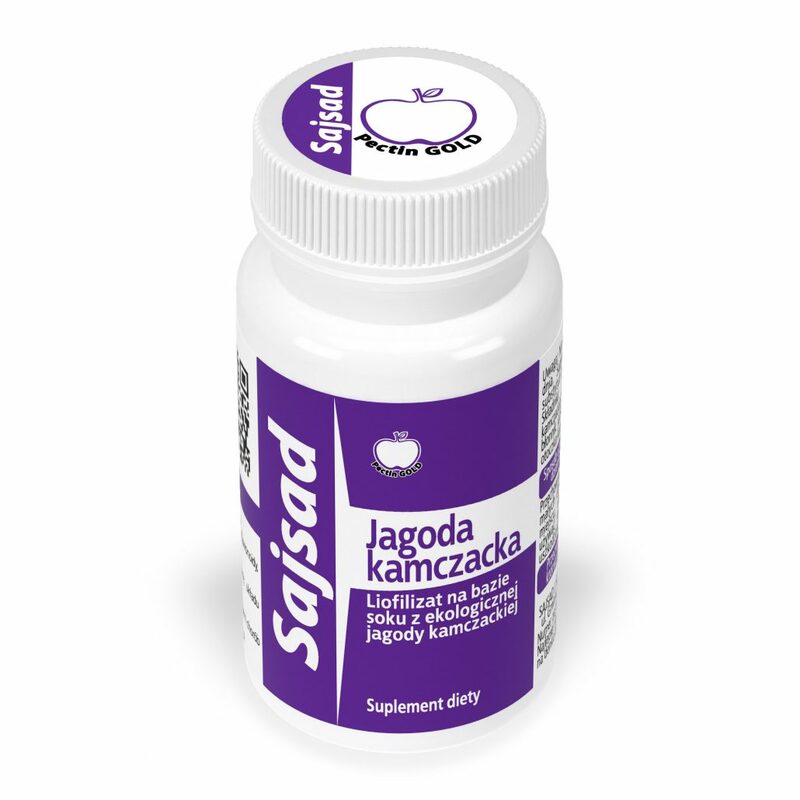 Helps protect the body against cardiovascular diseases. Has a positive effect on correct cholesterol levels. Hypersensitivity to any of the product’s components. The fruits of Kamchatka berry are characterized by high nutritional value, because they provide many valuable vitamins and minerals. They contain vitamin C, which is a natural antioxidant. This compound supports the functioning of the immune system, contributing to strengthening the overall immune ability of the organism and reducing the incidence of infections. Katchatka berry also provides vitamins from the B group, which ensure correct operation of the nervous system, and minerals essential for the organism: calcium, potassium, phosphorus and magnesium. The fruits of Kamchatka berry are also a source of other substances with antioxidant properties – flavonoids, anthocyanins and plant polyphenols. They reduce the hazardous effects of free oxygen radicals, thereby delaying skin ageing and preventing many chronic diseases – cancer, cardiovascular diseases (e.g. atherosclerosis, heart attacks, strokes), diabetes. This is why Katchatka berry is defined as the fruit of eternal youth. The properties of Kamchatka berry can be applied in folk medicine of many countries, especially in Northeastern Asia. Thanks to its health-promoting properties, the fruits of Kamchatka berry are frequently called the “elixir of life”. They are sweet-sour and contribute to lowering blood pressure, preventing the development of high blood pressure. The berry displays an effect of protecting the organism from cardiovascular diseases, e.g. atherosclerosis or heart attacks. The phenolic compounds found in the fruits of Kamchatka berry lower the risk of development of metabolic diseases such as diabetes and obesity. They also contribute to lowering the level of “bad” cholesterol, which can lead to cardiovascular diseases. reduce the negative symptoms of chemotherapy. as lichen planus, which characteristic symptoms include patches appearing on skin, mucous membranes, nails and genital organ areas. One of the desired properties of its fruits is its protection from the hazardous effects of ultraviolet radiation. In folk medicine, not only the Kamchatka berry fruits are used, but also its flowers. Healing herbal teas are prepared from the dried flowers, hampering the development of bacteria and viruses. They are also used in the prevention of colds, influenza and upper respiratory tract infections. In treating sore throat, rhinitis and gingivitis, it is suggested to use gargles prepared on the basis of Kamchatka berry flower herbal teas. The Kamchatka berry juice is used in mitigating the symptoms of peptic ulcer disease and treating skin diseases. Its fruits are widely used in the culinary world, not only as a sour snack. They are used as an ingredient of fruit salads, jellies and as an addition to ice cream and cakes. A wide variety of Kamchatka berry-based winter products include marmalades, jams and juices, but also health-promoting ciders. Kamchatka berry is a fruit whose medicinal properties have been appreciated in folk medicine of northern Russia, China and Japan for centuries. In Poland it is still not well known, but this has been changing changing, due to the fact that the cultivation of these fruits in our country is becoming more and more popular. 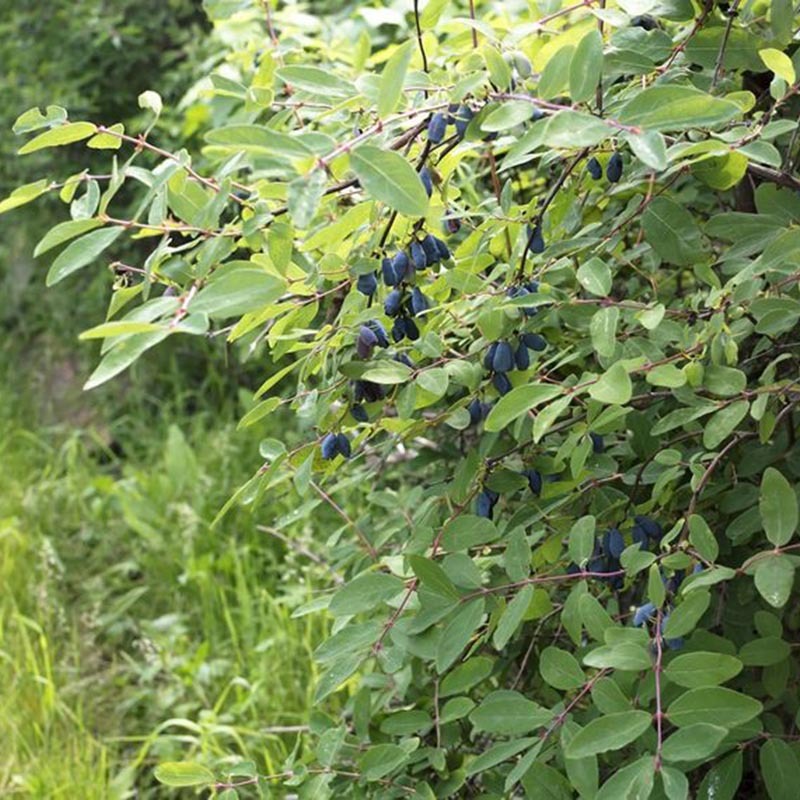 The blue-berried honeysuckle is a treasure trove of antioxidants, thanks to which it can be used as a protective agent against, among others, diabetes and cardiovascular diseases. What are the other healing effects of Kamchatka berry? 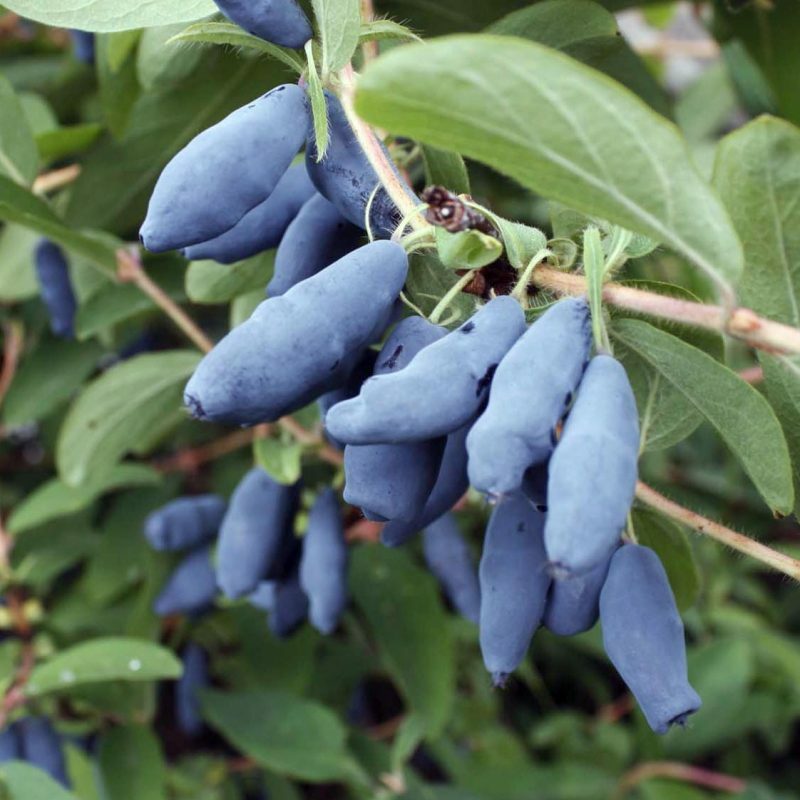 The Kamchatka berry is the fruit of a tree called Kamchatka Honeysuckle, a variety of blue honeysuckle (Lonicera caerulea L). Its properties have been appreciated and used in folk medicine of northern Russia, China and Japan for centuries. The fruits are even called the “elixir of life” by the native Ainu people, who reside the Japanese island of Hokkaido. The natural environment of Kamchatka berry is North-East Asia. It is grown in colder regions of northern Europe, including Poland. Kamchatka berry fruits are used in folk medicine as a strengthening material – reducing arterial blood pressure and the risk of heart attack, preventing anemia, slowing down the development of glaucoma and as an antimalarial drug, helpful in diseases of the digestive system and bacterial infections. Kamchatka berries are a source of vitamin C. They contain from 30.5 to 186.6 mg of ascorbic acid per 100 g of fresh weight, which is comparable to the content of vitamin C in redcurrant fruit (25.6-40.0 mg / 100 g), oranges (54.0 mg / 100 g fresh weight) or kiwi fruit (29.0-80.0 mg / 100 g fresh weight), recognized as a rich source of vitamin C. In addition, the berries contain B vitamins, magnesium phosphorus, calcium and potassium. However, the most important components of Kamchatka berries are phenolic compounds, such as anthocyanins, flavonoids, proanthocyanins and phenolic acids. Anthocyanins constitute the majority of polyphenols in Kamchatka berries. These compounds have strong antioxidant properties, thanks to which they help to prevent many diseases with underlying oxidative stress. The value of ORAC (absorption capacity of reactive forms of oxygen, expressed as μmol TE / 100 g) for Kamchatka berries is one of the highest among fruits and amounts to 13400 μmol TE / 100 gms.